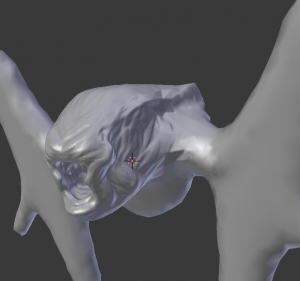 Dynamic topology sculpting test, ~75k-triangle result from created from a 12-triangle cube. I’ve made a lot of updates to the dyntopo branch on Github during the past few days. One side note: switching between sculpt and object mode is very unstable right now; when testing, recommend you switch in and out of sculpt mode from/to edit mode. When are we getting builds? Here is a Win64 build. What you show is incredible again. But I’ve make a build but it don’t seem to work. I make a cube then, go in sculpt mode, sclupt , but work exactly like before??? I have one suggestion to add to your “to do” list. Currently, sculpting with symmetry on results in different topology across the respective axis. It would be ideal to have the generated topology mirrored exactly, as Sculptris does. Thank you for your work. This has been the feature I most anticipated in blender for years. As an artist who most enjoys the sculpting and painting aspects of blender, you are my favorite developer. And I suppose the thumb brush is one of those brushes that need original coordinates – hence why it doesn’t work yet? At the moment, everything is geared towards testing dynamic topology, so regular sculpting (including multires) is likely to crash. This will not be hard to fix, it’s just not something I’m testing right now. The thumb brush indeed needs orig coords. I’m thinking for these brushes I may just delay topology updates until after the stroke finishes, thus allowing consistent coordinates. Still needs integration with undo though. This is awesome! Keep up the excellent work. Do you still plan to implement “Surface relaxation”? Currently dynamic topology is very hard to use to add details on smooth meshes. Currently I have to use some zero strength brush to subdivide, then smooth everything manually, loosing original details, even if all I wanted to add just few small details on top of I already have. I’m really grateful for dynamic topology, but without option to smooth/relax it is hard to add details to organic meshes without losing original details (because of necessity of manual smoothing to remove “dynamic” subdivision blocky artifacts).